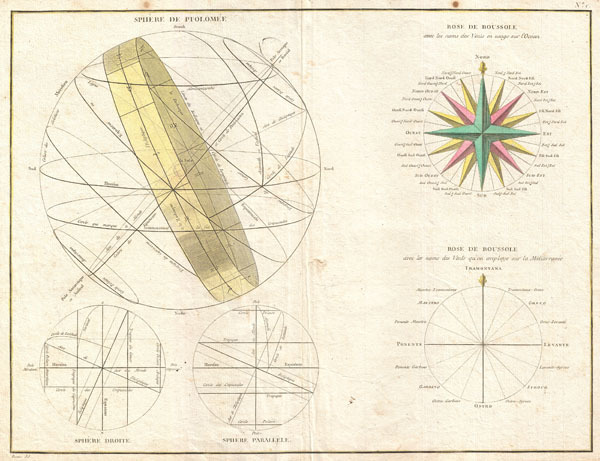 A beautiful example of Rigobert Bonne's curious decorative chart of the Spheres. Features five different spheres used in mapmaking and calculating map projections. From top left, Sphere de Ptolomee, Sphere Droite (Right Sphere), Sphere Parallele (Parallel Sphere), Rose de Boussole (Compass Rose), and another Rose de Boussole (Compass Rose). Drawn by R. Bonne around 1775 for issue as plate no. C in Jean Lattre's 1776 issue of the Atlas Moderne. Rumsey 2612.002. Phillips (Atlases) 664. National Maritime Museum, 215.